FoodThoughtsOfaChefWannabe: Slow Cooker Sticky Chicken! 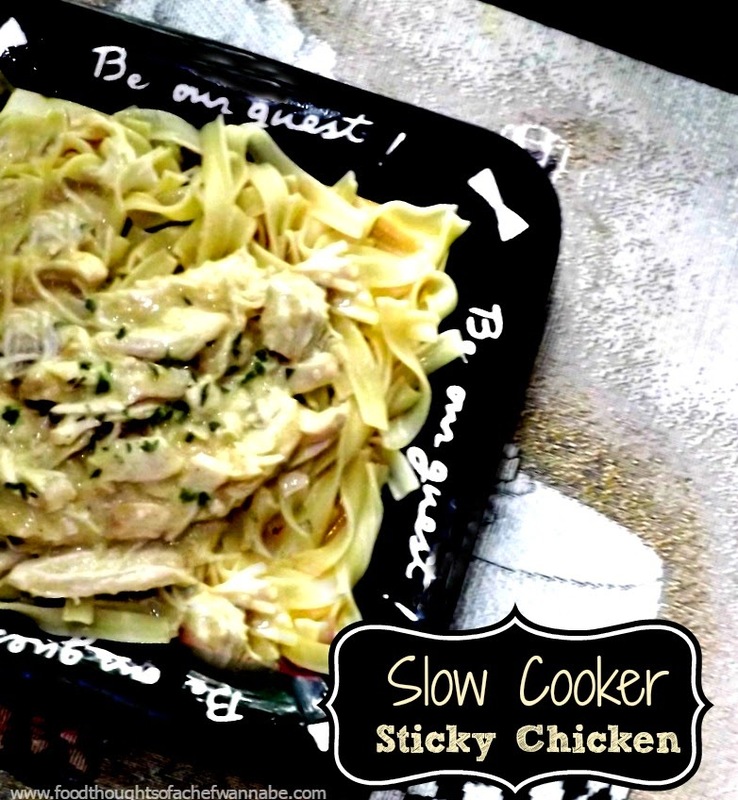 More slow cooker recipes! You asked for them, so I am trying to oblige you! 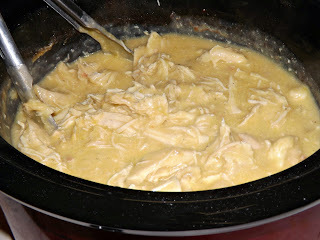 I am taking a few of our family favorites, that I never used a slow cooker for, and use the slow cooker for quicker, hearty meals that families and especially kids will love!! This "sticky chicken" as we call it, is DELICIOUS. I am not sure why we started calling it that, but we did, and the name has "stuck". Sometimes we eat it over rice, sometimes over egg noodles. The awesome thing about this recipe is, it will feed an army, AND the leftover options are endless. I have taken leftovers, added more stock, carrots, celery, and whatever rice or noodles are left for soup, I have added carrots, peas, potatoes, celery and slapped it in a pie crust for pot pie. I have also added chili powder, cheese, and cumin, and turned it into chicken enchiladas. I mean, you get my drift, you don't have to have the same leftovers again the next night. On a side note. This whole "shredding" thing, really REALLY sends me over the edge. I know I could use my fingers however, usually I am not patient enough to let things cool enough for that. By the way, as I type this, my mouth is watering and I have chicken skin (goose bumps) just thinking about it. If I use two forks, and the tines get stuck in each other, it almost sends me into shock. I am the woman who can't put silverware away in a drawer because it touches each other (now my teeth hurt) and the sound, OMG the sound. OK, I can't talk about it anymore. Here is this easy recipe that is probably one of the most versatile recipes on my website as far as leftover remakes! Place chicken breasts into your slow cooker. In a bowl combine, soups, stock, onion powder, garlic powder and salt and pepper. You may want to wait on the salt since the canned soups are fairly sodium laden (hangs head in shame). Mix ingredients until completely combined. Pour over chicken, flip chicken around in the mixture, cover, and set your slow cooker on high for 3-4 hours or low for 6-7 hours. When it is done, remove chicken to a plate and shred. When it is all shredded, add back into your creamy gravy-ish mixture and stir. Serve over rice or egg noodles. We love both but did egg noodles this time! I know this photo isn't the greatest, sometimes that just happens, but trust me when I tell you, it is comforting, filling and plain old good for the tummy! This looks great! I'm going to have to try it very soon. I need leftovers for lunch and this looks like the way to go. Call me so we can get together sometime soon!